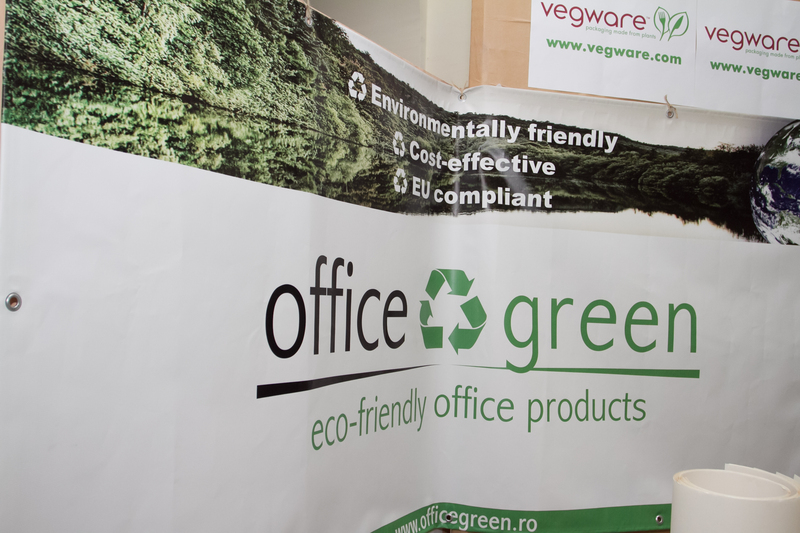 In the lobby area arranged by following the idea and the topic of the “Environment, Technology and Design” conference, held at UAUIM, RoGBC team prepared a Green Corner by using examples of sustainable procurement for an as green as possible office which follows the guidance of the well known sustainability principles: Reduce, Reuse, Replace and Recycle. 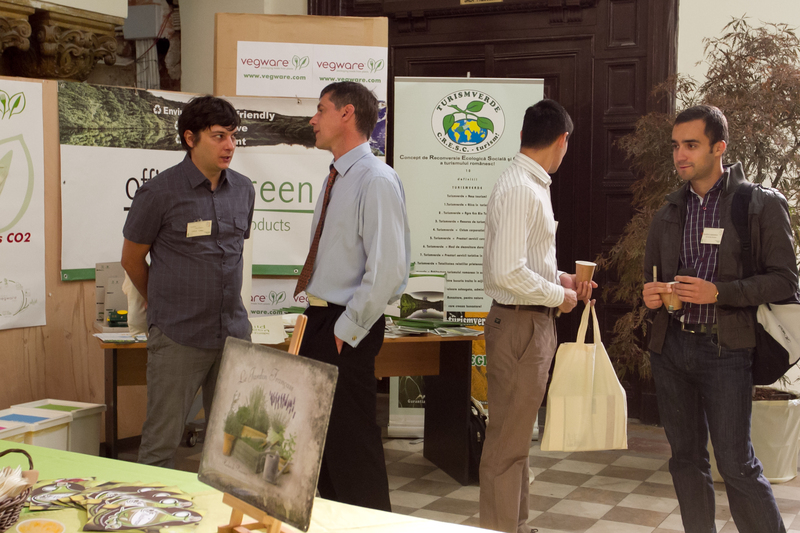 The idea of a booth is just one of the steps that we made for the development of the Green Office program. We made the most of the furniture and props offered by UAUIM. 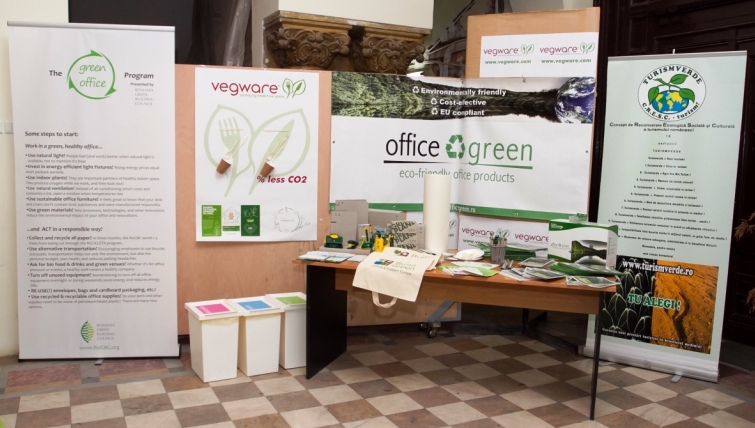 We covered the existing panels by using posters showing office products made by recycled material. The purpose of this unusual booth was not only the presentation but to determine the start to reflect on daily office practices. I saw, I asked, I understood, I got something concrete … I will implement it in my office too! For the next event we propose a more interactive green corner and more participants interested in “placed at the corner”. RoGBC member company – Printis has recently extended their green services to cover the business area. Printis is your complete and efficient solution for printing and document management. Order anywhere, anytime! 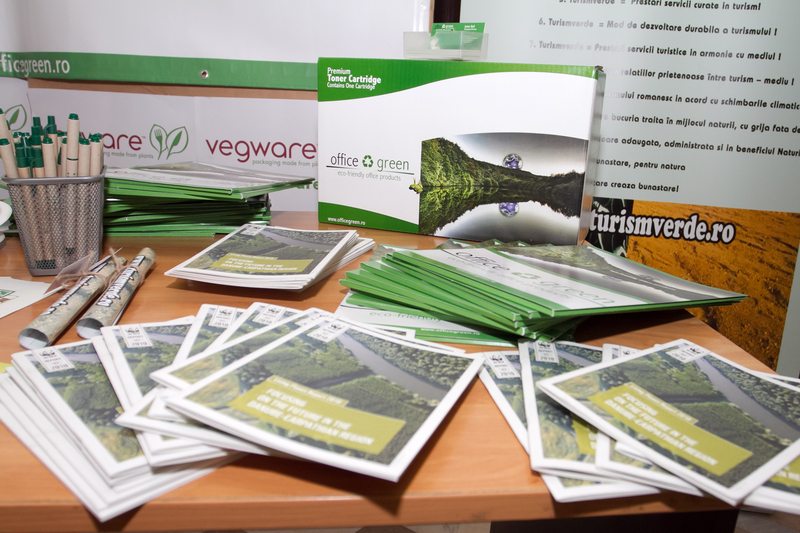 By printing green, you are sending a powerful reminder to your audience that you care about the environment. Their Green Division offers new products and processes that create a higher standard of environmental excellence. More information is available on www.printis.ro. Gaia Pro invest, Member of the RoGBC just released an editorial about “The Challenge of Building Green In Romania”, written from a developer’s perspective. The article addresses the need for sustainability within the construction industry. Read the full version of the article below. In nowadays, sustainability for the industry, business, and products is the topic of discussion around the world. Almost everywhere you look— real estate, energy, food industry, agriculture, or autos —“green” seems to be a common denominator in any news cut or corporate re­port. In the Real Estate sector, although it seems we are all convinced that “green” strategies are necessary, we are reluctant to pay a premium regardless of its price. Are developers willing to pay for green technolo­gies? And if so, how much? The initiative of any construction project in Romania in these post-crisis years might be considered as an act of courage. More than that, a green project is regarded at the beginning with condescension and “sympathy”. Everyone’s first question is “how green the project will be”, followed by “ok, it is an excellent idea but let’s see the concept developing step by step”. Responding to environmental problems and becoming energy efficient, has been generally a less imminent proposition for professional devel­opers, who primarily strive to secure financing in a subdued market. However, it is common sense that we cannot solve problems with the same mentality which we created them. 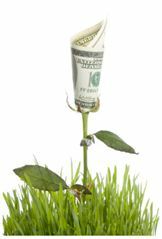 In this line of thought, being “green” is more a catalyst for wealth creation, communal health bene­fits, innovation, and new market opportunities, rather than an extra cost of doing business. Not a long time ago, building “green” in Roma­nia was deemed as an imported trend, with a predicted outcome, as the economic conditions and the weak support from the state authori­ties were discouraging factors. Nowadays, even with the local construction practices significantly im­proved and counting the support of truly innovative architects, the sustainability still does not come cheap or easy and applying its princi­ples is often difficult. The initiative and determination of few private developers brought results in delivering “green” projects which applied the sustainability principles. Not only the concern for the environment, but also competition and the continuous strive for product differentia­tion and, eventually market share, will make ‘green’ propositions inevi­tably necessary. This is especially true in lean times. All in all, demand from tenants will be growing and regardless of what market players believe now, an asset with a life span of more than 30 years has to be ahead of its time to survive competition. As with many things in many industries, worthwhile innovation is applied into everyday use, hence creating new or renewed demand for products and services. New tech­nologies would achieve a market breakthrough once customers find innovation as being very important, trendy, and adding new meaning and ‘experience’ in using the product or services. How Does A Sustainable Building Look Like? When considering a sustainable building, most people still, primarily, think of energy efficiency or renewable energy sources (i.e. solar power or wind power). However, as global trends are revealing, designing and constructing a green building usually involve additional factors beyond energy efficiency and renewable energy, such as the building‘s carbon footprint, indoor air quality, natural day lighting, water efficiency, native plants for landscaping, adaptability of space, proximity to public trans­portation, connectivity to basic services in the community, and use of nontoxic, ecological and recycled building materials. For Gaia Team’s projects, “green” is translated into two important as­sets: low energy consumption provided by the building concept (the thermal insulation to minimize energy requirements to heat/cool, en­hancement of the natural light, shadow elements and the green terrac­es), combined with the protection of the environment during operation, enhancing the indoor air quality through the use of paints and finishes that have little or no VOC (volatile organic compounds), the zero direct carbon emissions through the geothermal heat pump, heated/cooled floors and air-conditioning with energy recovery. But it’s not all about ‘what makes a building green’ or ‘how green the building is’, it’s more about ‘WHY’. Sustainable Building Education might sound like a cliché, but it has a tremendous role in preserving the envi­ronment, and this should be a major point on the “to do” authorities’ list. The education for “green” aspect is vital in all spheres from primary school to college, from roofing manufacturers, to city planners, develop­ers and real estate agents. When Does the Green Investment Pay Off? If sustainability was cheap and easy, most businesses would have achieved it by now, but it’s fundamentally difficult and often expen­sive. As long as building green in Romania will be considered more a new-imported trend rather than a necessity and the state involve­ment is limited, the price that comes with it is still high. From the architectural fees to the construction cost and even to the fee of the accreditation companies, the total extra development cost can easily reach 10% or more extra cost than the one of a conventional build­ing. The quantifiable advantage of a green building is the lower utilities cost, which can be even 40-50% less than those of a conventional building. Depending on the size of the building and its energy con­sumption, this cost can be amortized in 5-10 years. But, there is also the qualitative advantage that is of higher value, even if it cannot be financially measured. It has been proven that mindful-designed green office buildings yield greater employee productivity, less absenteeism, and stronger attraction and retention of employees than standard buildings do. We strongly believe that corporate sustainability won’t occur without a company mandate that springs more from ethics, rather than eco­nomics, and the reality is we can no longer afford not to act responsi­bly. Our projects represent a visible statement of the company, Gaia Team, about the strong environmental commitment in the first place. Gaia Pro Invest: Aristotle asked what it means to lead a moral life. Before business even approaches sustainability, that question will need to move from the classroom to the boardroom. If sustainability was cheap and easy, most businesses would have achieved it by now, but it’s fundamentally difficult and often expen­sive. As long as building green in Romania will be considered more a new-imported trend rather than a necessity and the state involve­ment is limited, the price that comes with it is still high. From the architectural fees to the construction cost and even to the fee of the accreditation companies, the total extra development cost can easily reach 10% or more extra cost than the one of a conventional build­ing. The 2008/98/CE Waste Framework Directive has to be transposed into the national legislation by the end of the year. This directive is important for the construction industry because it aims at recovering 70% of the construction waste by 2020. More information about this directive and a brief analysis of the law project proposed by the Ministry of Environment are available here. This analysis was carried out by Luiza Manolea, lawyer member of RoGBC in the Legislative Outreach Group. from a generous donation to the RoGBC by Friedrich Niemann, General Manager of the Athenee Palace Hilton Bucharest. Friedrich had previously a bike when all 250 employees of the Hilton in Bucharest received a free bicycle for their part in winning a European-wide contest within Hilton International for the property with the greatest energy efficiency improvements. 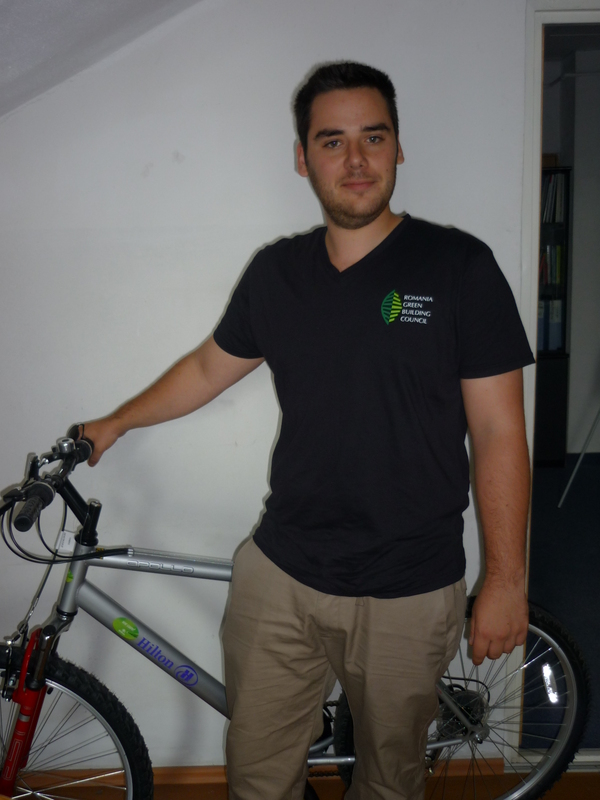 Friedrich, an avid cyclist who already owned a bike, thought we could put his new one to good use in our Council. He was right. While our team tries to utilize public transit as much as possible, there are times when we previously needed to take a taxi to meetings and events. We did an estimated payback period for a bike and concluded – assuming we paid 300 Euro for the bike – it would be paid back in less than 12 months. Paying zero Euros for the bike helped our payback period even more. Thanks Friedrich! 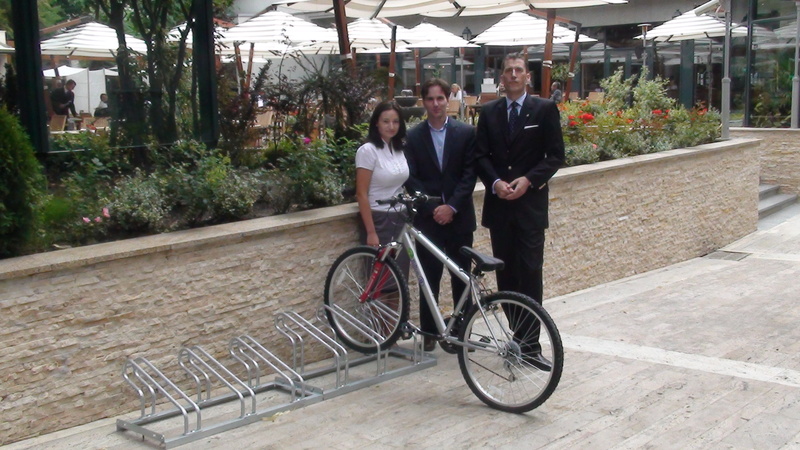 Hilton also installed plenty of bicycle parking in front of its Roberto’s on La Strada Terrace and for its employees to put their new bicycles. and… visitors to the RoGBC office… please feel free to visit us with your own bike!